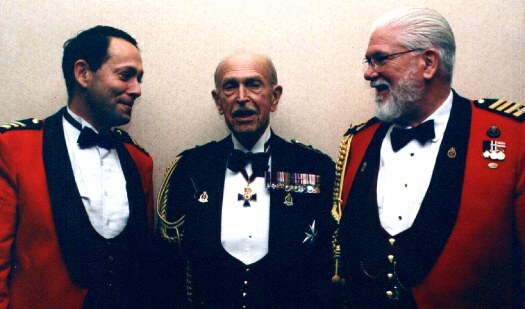 Three Canadian officers in shawl or rolled collar jacket and waistcoat style mess dress or mess kit. Miniature medals and other accoutrements are also worn. Mess dress is the military term for the formal evening dress worn by military officers in the mess or at other formal occasions. It is also known as mess uniform and mess kit. It frequently consists of a mess jacket and trousers worn with a formal shirt and other formal accessories, though the exact form varies depending on the uniform regulations for each service. This style of military dress is largely restricted to the British, Commonwealth of Nations and United States armed forces, though it is also sometimes worn by members of civilian uniformed services and members of a Royal Household. The French, Imperial German, and other navies adopted their own versions of mess dress during the late nineteenth century, influenced by the Royal Navy. While predominantly a uniform worn by commissioned officers for whom it is mandatory, it may also be worn as an optional uniform by senior enlisted personnel in the U.S. Navy and U.S. Air Force, and by non-commissioned officers in the British Army and Royal Air Force. The Royal Navy and some other navies distinguish between mess dress, which is now the equivalent of civilian white tie, and mess undress, which is the equivalent of black tie. Officers of the rank of captain and above wear gold-laced trousers (the gold lace stripes are nicknamed "lightning conductors"), and may wear the undress tailcoat (without epaulettes), with either mess dress or mess undress. The undress tailcoat is so named to distinguish it from the full dress tailcoat that was worn during the day with full dress (No. 1), which is worn in a modified form by admirals today as ceremonial day dress. Both the undress tailcoat and the mess jacket are double-breasted, with peaked lapels and six gilt buttons, but cut to be worn single-breasted and fastened at the front with two linked gilt buttons. The undress tailcoat is fitted with scallop-flapped hip pockets with three gilt buttons on each pocket. Rank is indicated on the undress tailcoat and mess jacket by gold lace on the sleeves. When tropical rig is ordered, a white mess jacket is worn instead of the blue, with shoulder boards to indicate rank. Mess dress and mess undress are today worn with a soft marcella-fronted shirt with a soft collar. Stiff marcella-fronted shirts and stiff wing collars were previously worn with all forms of evening dress, but were abolished first for mess undress, and finally in the mid-1990s for mess dress. Rear admirals and above may continue to wear the stiff shirt and collar with mess dress. Cummerbunds, which may be worn with mess undress instead of the blue waistcoat and with Red Sea rig (No. 2C), are frequently decorated with badges or colours proper to the ship or establishment in which the officer serves. For example, HMS Glasgow – Black Watch tartan; HMS Illustrious – green with the ship's logo (three crossed trumpets) in gold; Royal Naval Engineering College (RNEC) – engineers' purple with the RNEC lettering in gold. Traditionally, half-Wellington boots were worn with mess dress and mess undress, but today shoes are more common. The optional outer garment worn with evening dress is the boat cloak, which is a knee-length navy blue cloak lined with white silk, with four gilt buttons, and fastened at the neck with two gilt lions' heads joined with a chain. Miniature medals are worn with both mess dress and mess undress, though previously medal ribbons only were worn with mess undress on routine occasions, such as by the officer of the day. Officers who are members of orders of chivalry wear their stars and ribbons as appropriate. The Elder Brethren of Trinity House are authorised to wear a mess dress based upon that of a Royal Navy Captain. Mess uniforms first appeared in the British Army in about 1845. The original purpose was to provide a relatively comfortable and inexpensive alternative to the stiff and elaborate full-dress uniforms then worn by officers for evening social functions such as regimental dinners or balls. With the general disappearance of full dress uniforms after World War I, mess dress became the most colourful and traditional uniform to be retained by most officers in British and Commonwealth armies. Immediately after World War II the cheaper "blue patrols" were worn for several years as mess dress, but by 1956 the traditional uniforms had been readopted. The formal designation of the most commonly worn mess uniform in the British Army is "No. 10 (Temperate) Mess Dress". The form varies according to regiment or corps, but generally a short mess jacket is worn, which either fastens at the neck (being cut away to show the waistcoat (vests)—this being traditionally the style worn by cavalry regiments), or is worn with a white shirt and black bow tie (traditionally the usual style for all other regiments, corps, and services). Since the regimental amalgamations of recent years, the cavalry-style jacket has been adopted by some British Army regiments and corps, such as the Adjutant General's Corps and the Royal Logistic Corps. Officers of the Brigade of Guards still wear the infantry style of jacket, as do others, including the Royal Engineers, the Parachute Regiment, the Royal Army Medical Corps, and the Royal Regiment of Scotland. The simpler infantry-style uniform remains popular in Commonwealth armies. The colours of mess jackets and overalls reflect those of the traditional full dress uniforms of the regiments in question, as worn until at least 1914. Jackets are, therefore, usually scarlet, dark blue, or rifle green, with collars, cuffs, waistcoats, or lapels in the former facing colours of the regiments in question. In the case of those regiments which have undergone amalgamation, features of the former uniforms are often combined. Waistcoats are often richly embroidered, though with modern modifications, such as a core of cotton for gold cording instead of the thick gold cord which made these items very expensive prior to World War II. Non-commissioned officers' mess dress is usually simpler in design, but in the same colours as officers of their regiment. Most British Army regiments' mess dress incorporates high-waisted, very tight trousers known as overalls, the bottoms of which buckle under leather Wellington or George boots. Ornamental spurs are usually worn in cavalry regiments; some other regiments and corps prescribe spurs for field officers, since in former times these officers would have been mounted. The Rifles do not wear spurs at any rank, following Light Infantry traditions since historically no Light Infantry officer rode on horseback. Scottish regiments wear kilts or tartan trews, and some wear tartan waistcoats as well. In "No. 11 Warm Weather Mess Dress", a white drill hip-length jacket is worn with either a waistcoat in the same material or a cummerbund of regimental pattern. Blue and various shades of red or green are the most common colours for the cummerbund. Trousers or overalls are the same as in No. 10 Dress. Female officers and soldiers wear scarlet or blue cavalry-style mess jackets resembling those of their male counterparts over dark-coloured ankle-length evening dresses. Black hand bags may be carried, and black evening shoes are worn. White tie apparel is usually obtained from the mess kit by wearing a detachable wing-collar dress shirt, gold shirt studs, a white dress waistcoat, and often white cotton gloves. The black bow tie is retained. No. 5 Mess dress in the Royal Air Force is similar to that in the Royal Navy, except that the jacket and trousers are in mid-blue. For the most formal occasions, such as court balls and royal evening receptions, a white bow tie is worn with a white waistcoat. For all other evening events, a black bow tie with a mid-blue waistcoat (No. 5B) or a slate grey cummerbund (No. 5) is worn. Cummerbunds of a particular squadron or unit design may also be worn. A further variation is the No. 5A which has a white waistcoat and white bow tie. Among Scottish-based units, a kilt of grey Clan Douglas tartan was initially authorised, but the recently approved official RAF tartan is now authorised. The tartan, designed in 1988, was officially recognised by the Ministry of Defence in 2001. A variation of No. 1 Service Dress (SD) is also permitted; the usual blue shirt and black tie are replaced with a white shirt and black bow tie. This dress is referred to as No. 4 Mess Dress. For women, mess dress currently consists of the same style high-waisted blue-grey single-breasted jacket and white marcella shirt as men, a small bow tie and cummerbund, and a straight ankle-length blue-gray skirt, worn with patent-leather court shoes and barely-black tights or stockings. From the 1970s and prior to the introduction of current women's mess dress in 1996, female officers wore a royal blue Empire line dress made of crimplene material with a loose mandarin neck, long sleeves, and an ankle length hem. Rank was indicated on a small enamelled brooch worn near the neck. Officers in the RAF Air Cadet Organisation may purchase the No. 5 Mess Dress at their own expense or wear the permitted No. 4 Mess Dress variation of No. 1 SD uniform. Police officers may wear mess dress to formal dinners if appropriate, but is it most typically worn by officers who have achieved the rank of Superintendent or above. The mess dress of the Commissioner of the Metropolitan Police is dark blue with light blue facings on the lapels, and includes a two-inch oak leaf lace strip on the trousers and a set of aiguillettes. The Australian Army has mess kits for summer and winter. The summer mess kit is a white jacket, almost identical between different parts of the army. The winter mess kit is made of thicker material, with jackets in the colour of the wearers' corps. The winter mess dress includes a waistcoat. Both kits have the same trousers, but trousers vary slightly between corps. Women's mess attire is the same, except that women wear a skirt instead of trousers. Both versions have a bow tie and white shirt. Mess dress is worn as formal evening attire for mess dinners. Uniforms range from full mess dress (with dinner jackets, cummerbunds or waistcoats) to service dress worn with a bow tie for individuals not required to own mess dress (generally non-commissioned members or members of the reserves). Mess dress is not provided at public expense. However, all commissioned officers of the regular forces are required to own mess dress within six months of being commissioned. The winter mess dress (No. 2) for the Royal Canadian Navy consists of a black jacket with gold laced rank insignia worn on the sleeve, gold-laced black trousers worn by all commissioned officers (unlike in the Royal Navy they are not restricted to captains and flag officers) white shirt with soft or wing collar and a white waistcoat. Officers of the rank of Captain(N) and above wear a tailcoat instead of the standard jacket. NCMs trousers are the same pattern, but without gold lace down the seam. Miniatures of medals earned are worn on the left lapel; miniatures of qualification badges earned are worn on the left breast of the jacket. Summer mess dress (No. 2A) is similar except that a white jacket with rank insignia on black shoulder boards (gold covered for flag officers) is worn, and the waistcoat is not worn. The winter standard pattern mess dress (No. 2) for the Canadian Army consists of a scarlet jacket with rank insignia worn on soft shoulder loops, scarlet-laced black pants, white shirt with soft or wing collar and black waistcoat. The details of regimental distinctions vary by regiments and are defined in detail in the Canadian Forces Dress Instructions. Miniature medals are worn on the left breast above miniatures of qualification badges earned. The summer standard pattern mess dress is similar except that a white jacket with rank insignia worn on black shoulder boards, and cummerbund, is worn. Army reserve regiments are authorized to wear mess dress that is distinctive to the regiment which can consist of jackets of different cuts (for example high collar) and colours than the standard pattern mess dress. Authorization for summer dress (No. 2A) consisting of the white jacket in lieu of scarlet varies from regiment to regiment, but typically is not authorized for NCMs below the rank of Warrant Officer. The winter mess dress of the Royal Canadian Air Force consists of a midnight blue jacket with gold rank insignia worn on the sleeve, black-laced midnight blue trousers, white shirt with soft collar, and a cummerbund in the colours of the Royal Canadian Air Force tartan. Miniature medals are worn on the left breast above miniatures of qualification badges earned. The summer mess dress (No. 2A) is similar except that a white jacket with rank insignia worn on midnight blue shoulder boards is worn, and is authorized as an optional order for RCAF officers only. No. 2B is authorized as an alternative for officers who have not yet purchased mess uniform, and for all NCMs as they are not required to purchase mess uniform. It applies to all three elements and consists of the standard service dress uniform appropriate to the element (rifle green for the Army, navy blue for the RCN and light blue for the RCAF), a white long-sleeved shirt (as issued to navy personnel) and a black bow tie. Undress ribbons and nametag are worn. No. 2C is a relaxed, ship-board only order of mess uniform, worn by members of all elements when dining formally onboard HMC Ships at sea. It consists of the service short sleeve shirt and service dress trousers appropriate to the element, a cummerbund in black or authorized regimental colours. Name tag, medals/ribbons are not worn. No. 2D is the CF standard pattern mess dress, now superseded, which was authorized for wear prior to reversion to separate environmental uniforms for Army, Navy and Air Force. It is identical to Air Force No. 2 dress except that buttons and other accouterments reflect the unified CF uniform prevalent from 1968 to circa 1987. It is authorized for wear by personnel who had joined and acquired their mess uniform prior to the re-establishment of distinctive environmental uniforms. Both senior non-commissioned officers and commissioned officers of the Jamaica Defence Force may wear (No. 5 Dress) mess kit. The New Zealand Army, Navy and Air Force have mess uniforms of similar style to those worn by the equivalent British and Australian services. Mess uniforms authorised for army officers have recently been simplified in that the distinctive corps and regimental colours previously worn have been replaced by a universal scarlet and blue pattern with only insignia to distinguish one branch or unit from another. In the Pakistan Armed Forces, mess uniform is only worn for high-level evening events. The style of the Pakistani mess dress largely resembles that of the British Armed Forces. Mess uniform is worn by Pakistani military officers posted abroad, either as Military attachés (Air attaché, Naval attaché, Defence attaché) or by high-ranking officers on official state visits. Senior military officers, such as one- to four-star officers, are required to wear mess dress on appropriate occasions during such visits or while attending state inaugurations. All mess uniforms are bespoke tailored for specific officers according to their assignments and ranks. The use of mess dress in the United States Uniformed Services is a more recent trend, which started in the early 20th century. In 1902, when the U.S. Army adopted its last standing collar blue uniform for full dress, a modified form of civilian tail coat was also introduced for evening dress, worn with a white tie and vest. This was known as the special uniform for evening wear. At the same time, a mess uniform resembling the British pattern was authorized for less formal evening occasions. The short mess jacket was either dark blue or white, according to climate. After 1911 the blue jacket included lapels in branch color (yellow for cavalry, red for artillery, light blue for infantry, and so on). The individual officer could wear full dress or either of the evening dress alternatives for social functions. In view of the expense involved, it was usually senior officers who appeared in mess or evening dress uniforms. While the blue full dress was worn from 1902 to 1917 by all ranks for ceremonial parades within the continental United States, the two optional evening uniforms were authorized only for officers. The various blue uniforms ceased to be worn after 1917. However, the white mess uniform for commissioned and warrant officers was authorized again in 1921. In 1928, wearing of the full range of blue dress uniforms was authorized for all ranks, but only when off duty, and at the expense of the individual. In practice, this meant that only the pre-1917 mess uniform, and to a lesser extent the special evening wear, reappeared in significant numbers. After World War II, the evening dress and mess dress uniforms were reintroduced, with the tail coat having a single Austrian knot (trefoil) over the branch-of-service color (general officers had stars over an oak leaf braid), with the rank placed in the bottom opening of the knot. The mess jacket, intended for black-tie occasions, used an Austrian knot rank system with the branch insignia at the bottom. The number of knots indicated the officer's rank: five for colonel, four for lieutenant colonel, three for major, two for captain, one for first lieutenant, and none for second lieutenant. This complicated system was replaced with the evening coat style (which lost its "tails" in the late 1960s) in 1972, using a single knot and the rank placed above the branch-of-service color. A white mess jacket for summertime wear was introduced in the 1950s. The special evening dress or tail coat finally disappeared in 1975, replaced by the Army blue mess uniform, which in its modern form closely resembles that of 1911.It is common for soldiers to wear suspenders in their branch color with the army dress uniform trousers, although they are concealed under the coat. Miniature medals are suspended on ribbons one half the width of their normal counterparts, and are worn on the left lapel. Exceptions to the miniature medals are the Medal of Honor, the Presidential Medal of Freedom (although the PMF also includes an optional miniature version), and authorised foreign neck-borne decorations (e.g., Knight Commander of Order of the Bath, Commander of the Order of Military Merit, et al.) Individual and unit awards that consist of ribbons only are not worn on the mess uniform. Miniature versions of combat and special skill badges are worn above the miniature medals, along with miniature versions of Ranger and Special Forces shoulder tabs, made of enamelled metal. Marksmanship and driver/mechanic badges are not worn on the mess uniform. Regimental distinctive insignia is worn on the right lapel. Identification badges worn on service uniform pockets, such as the Drill Sergeant Identification Badge, Presidential Service Badge, Recruiter Badge, Office of the Joint Chiefs of Staff Identification Badge, et al., are worn between the top and middle buttons on the applicable side of the mess uniform. The lapels of enlisted mess uniforms are uniformly dark blue, rather than utilizing a branch color. Enlisted rank insignia is worn on the sleeve in the same manner as on the service uniform tunic. Below, on both sleeves, are long service stripes in place of the shorter stripes used on the service uniform. The same longer service stripes were worn on both sleeves of the blue dress uniform tunic until the blue dress uniform was reconfigured to be the Army's service uniform and replace the green service uniform. In the 1950s and 1960s, the U.S. Air Force formal uniform consisted of a civilian black tailcoat with added military sleeve braid and rank insignia. It could be worn as either a black tie or white tie combination. Due to the tails, it was not considered a mess dress uniform. The original U.S. Air Force mess dress consisted of a short black jacket with black trousers, with a white jacket for summer wear. The jackets had satin lapels with matching satin sleeve braid. It entered service in the 1960s and was phased out in the 1980s. It is still sometimes worn by retired officers. The current mess dress is similar in cut and tailoring, but in a dark blue color for year-round wear. The current pattern was introduced in 1981 and is also similar to the Royal Air Force design, except that the coat and trousers are dark blue. Dark blue bow ties and dark blue cummerbunds are used for black-tie affairs, and white bow ties with white waistcoats for white-tie affairs. Silver-trimmed shoulder boards and silver sleeve braid are worn rather than rank braids (enlisted members wear sleeve rank insignia instead of shoulder boards, and no silver sleeve braid), along with silver buttons. No hat is worn. General officers have solid silver shoulder boards and wider silver sleeve braid. Enlisted members also have the option to wear the semi-formal uniform, essentially an issued service dress with a white shirt substituted for the blue shirt, but many non-commissioned officers elect to purchase a mess dress. Women's mess dress uniforms have a long skirt replacing the trousers and delete the button chain clasp for the coat. The United States Marine Corps mess dress uniforms dates from the late 19th Century. Mess dress is reserved for staff NCO and officers; junior enlisted members wear dress blues. Marines wearing evening dress. The centre right male officer is wearing the boat cloak as an outer garment. The uniform coat of commissioned and warrant officers is fastened at the neck, similar to that of the dress blue uniform, but is cut away, cavalry-style, to expose the shirt and scarlet cummerbund (general officers have a scarlet vest with small gold buttons). Rank, in gold or silver wire, is embroidered directly on the shoulder epaulettes, which are bordered with gold wire and scarlet piping. The collar and cuffs are also bordered in gold wire and scarlet, bearing a quatrefoil for warrant officers and company-grade officers, a single row of oak leaves for field officers, and a double row of oak leaves for flag officers. The uniform is completed with midnight blue trousers with gold and red stripes, with an optional wool boat cloak—a midnight blue knee-length cape lined in scarlet silk. Staff non-commissioned officers (SNCO – staff sergeant to sergeant major / master gunnery sergeant) wear a double-breasted mess uniform similar to that of navy officers, except with the standard dress blue trousers with blood stripe, scarlet cummerbund, and black bow tie. The jacket is cut so as to have no overlap, but with the sides clasped together. A white vest, for all officer ranks, and the white bow tie and vest, for SNCOs, is worn for evening dress functions. A summer white mess dress, similar in design to U.S. Navy and U.S. Coast Guard uniforms, but with shoulder epaulettes instead of rank boards, was worn until the mid-1990s, when it was phased out. Officers and chief petty officers of the U.S. Navy, U.S. Coast Guard, United States Public Health Service Commissioned Corps, NOAA Corps, and Merchant Marine use the same mess uniform, referred to as "dinner dress". There are three styles of this uniform—dinner dress, dinner dress jacket, and tropical dinner dress. Dinner dress uniforms, blue and white, are modifications of service dress blue or service dress white uniforms, with the service ribbons and breast insignia replaced by miniature medals and miniature breast insignia. Additionally, officers and chief petty officers wear an evening shirt and black bow tie with dinner dress blue. Dinner dress blue jacket and dinner dress white jacket consist of a black waist-length jacket with gold buttons (officer) or silver buttons (petty officer first class and below). The jacket is double-breasted, but does not overlap, and is held with a clasp. (This, in contrast to double-breasted civilian evening jackets, which are worn fully open, or double-breasted smoking jackets which are worn fully overlapped and buttoned). Bullion or imitation bullion rank stripes are worn on the sleeves of the officers' blue jacket, and a rating badge and service stripes are worn by enlisted personnel. On the officers' dinner dress white jacket, hard shoulder boards are worn. A gold cummerbund is worn by officers and chief petty officers, and a black one by petty officers first class and below. Shirt studs and cuff links are gold for officers and chiefs and silver for petty officers first class and below. A hat or cap is not required with dinner dress jacket uniforms, but may be worn. For both genders, it must be worn with an outer garment, which is traditionally the boat cloak for males and cape for females. Females do not need to remove headgear indoors when wearing the tiara. The boat cloak, tiara, and cape, all being optional items, are very rarely seen. Tropical dinner dress blue incorporates service dress blue trousers, summer white (short sleeve) shirt, an appropriate cummerbund, and miniature medals and breast insignia. An additional uniform, formal dress (white tie), is optional for all commissioned officers, but may be prescribed for captains and above. This uniform is worn as an equivalent to civilian white tie dress. It is almost identical to the dinner dress blue jacket, except a wing collar shirt, white waistcoat, and white tie are worn. A formal blue tailcoat may also be prescribed. Members of the U.S. Coast Guard Auxiliary wear the same dinner dress uniforms as the U.S. Navy and U.S. Coast Guard, but with a silver cummerbund and silver Coast Guard Auxiliary officer insignia in place of the gold insignia. Petty officers and below may, at their option, wear this same uniform, but with a black cummerbund and silver buttons. Mess uniforms were worn by officers of the Imperial German Navy, though not by army officers. During the 1930s in Nazi Germany, officers of the Schutzstaffel (SS) had the option of purchasing mess dress uniforms. SS mess dress resembled a double-breasted dinner jacket, with collar tabs and white piping. In modern Germany, mess dress is a permitted uniform for officers and non-commissioned officers (NCOs) of the Bundeswehr attending white or black tie festive social occasions. Female soldiers wear a long dark-blue skirt and a white blouse with the Bundesadler ("Federal Eagle" coat of arms) on the right collar. This is combined with a long scarf across the chest and a dark blue short velvet jacket. A variant with a short white silk jacket combined with a blue blouse is also permitted. Purses and other accessories may be carried. The basic mess dress (Grundform) for men consists of a jacket with a chain closure, trousers with black silk trim strips, and either a cummerbund (army, air force, navy) or a Torerobund (a torero-style waist sash, for the army and air force). These sashes or cummerbunds are of black fabric for the army and dark blue for the air force and navy. The chain is gold for the navy and for army and air force generals; others wear a silver chain. This is matched by a white dress shirt (with a concealed placket; no stand-up collars, ruffles, or embroidery) and a black bow tie and black or black patent leather shoes. As a variation, a black smoking jacket with black silk collar and black silk-covered passant (Army, Air Force) may be worn instead. The ranks are embroidered onto the epaulettes. The jacket is worn without cuff titles, collar patches, or any other coloured insignia. In the navy, rank insignia is placed on the sleeves. Activity, proficiency, or specialist badges are often included in the embroidered portion. Miniature versions of any orders and decorations are worn from ribbons. In keeping with the Israel Defense Forces' doctrine of a People's Army, mess uniform is not worn inside Israel. It is only worn abroad, either by military attachés or by senior officers on official state visits. These rules also apply to the IDF dress uniform. Because of the small number of uniforms required they are bespoke tailored for the specific officer. The mess uniforms are the only version of an Israeli army uniform to include a tie, and have a summer version and a winter version. The "lesser" (liten) and "full" (stor) mess dress are two uniforms of the Swedish Armed Forces uniform subgroup of "society uniforms" (sällskapsuniformer). Aside from mess dress, this group also includes "formal wear" and "society wear". Swedish full mess dress is formal wear to be worn on occasions when a civilian would wear white tie or a tailcoat. The Swedish Army code for full mess dress is m/86, the navy is m/1878, and the air force m/1938. The numbers represent the year in which the style was introduced. Additional clothing includes a cloak (akin to the boat coat), galoshes, and a scarf, as well as any medals. With the full mess dress one may also wear braces or a waistcoat in one's branch colours. The Swedish lesser mess dress is the equivalent of the civilian black tie. It is the same as the British mess undress or the American mess dress blues. Army officers and cadets may replace the blue vest and sash or the lining of a cloak with traditional regimental or branch-specific colours. A rifle may be carried, but is not obligatory. Mess dress is a permitted uniform, in that it is allowed to be worn on defined occasions, but possession is not obligatory. There is always a corresponding form of obligatory uniform that may be worn as an alternative (army: m/87 A, navy: m/48, air force: m/87). Full mess dress is thus matched by högtidsdräkt (formal wear) and the lesser mess dress by sällskapsdräkt (society wear). Formal wear is the same as parade dress, when worn at the equivalent of a white tie occasion. "Society wear" is the service dress uniform, when worn to a black-tie occasion. Formal and society wear (rather than mess dress) are the mandatory uniform types for any military event, funeral, parade, state visit, or any other non-festive occasion. Wikimedia Commons has media related to Mess dress. ↑ yeomenoftheguard.com - gentlemen at arms. ↑ Trendell (1921), pp. 23–26. ↑ Trendell (1921), p. 192. ↑ Carman (1977), p. 90. ↑ Barthorp (1984), p. 173. ↑ War Office (1911), Sections 578–582. ↑ Newark (1998), p. 129. ↑ "Rifle Dress Guidance". http://www.army.mod.uk/documents/general/Rifles_Dress_Guidance_as_at_June_2009.pdf. Retrieved 2 July 2012. ↑ Barthorp (1982), p. 137. ↑ "Royal Air Force Tartan". kamrafa.co.uk. http://www.kamrafa.co.uk/. Retrieved 8 August 2009. ↑ "Police Mess Dress – Gentleman's Military Interest Club". http://gmic.co.uk/index.php/topic/4423-police-mess-dress/page__p__365174#entry365174. Retrieved 16 March 2012. ↑ "Mess Uniform – PoliceSpecials.com Forum". http://www.policespecials.com/forum/index.php?/topic/60110-mess-uniform/page__p__1187341#entry1187341. Retrieved 13 February 2012. ↑ "Web Site of the Jamaica Defence Force". http://www.jdfmil.org/equipment/uniforms/uniform_home2.php. Retrieved 25 March 2012. ↑ "United States Navy Uniform Regulations". Archived from the original on 25 May 2009. http://web.archive.org/web/20090525094939/http://buperscd.technology.navy.mil/bup_updt/508/unireg/Chapter3/uniformsMenu.htm. Retrieved 2 July 2012. ↑ "Two Black Tires: Fractured Prune and Arlington Uniform Shop". twoblacktires.blogspot.ca. http://twoblacktires.blogspot.ca/2009/03/fractured-prune-and-arlington-uniform.html. Retrieved 2 July 2012. ↑ "United States Navy Uniform Regulations-Tailcoat, Formal, Blue (Male Officers)". Archived from the original on 3 July 2008. http://web.archive.org/web/20080703030758/http://buperscd.technology.navy.mil/bup_updt/508/unireg/Chapter3/3500_seriesArticles/3501_85.htm. "This coat may be prescribed for males, captains and senior, to meet certain unique protocol requirements." ↑ Bundeswehr Dress Code, para. 262/1. ↑ 21.0 21.1 Bundeswehr Dress Code, paras. 261–264. ↑ "The Royal Family's Attire". Royal Court of Sweden [Sveriges Kungahus]. 19 06 2010. http://www.kungahuset.se/royalcourt/mediacentre/pressreleases/olderpressreleases/pressreleasesearlier/theroyalfamilysattire.5.40e05eec12926f2630480003630.htm. ↑ 23.0 23.1 Swedish Uniform Regulations, pp. 86–87. ↑ Swedish Uniform Regulations, p. 43. Knötel, Richard; Knötel, Herbert; Sieg, Herbert (1980). Uniforms of the World: A Compendium of Army, Navy, and Air Force Uniforms, 1700–1937. New York: Scribner. ISBN 978-0-684-16304-8. http://books.google.com/books?id=mQYhAQAAIAAJ. Retrieved 26 May 2012. Trendell, Herbert A. P, ed (1921). Dress and Insignia Worn at His Majesty's Court, Issued With the Authority of the Lord Chamberlain. London: Harrison. OCLC 13090804. http://archive.org/details/dressinsigniawor00greauoft. Retrieved 26 May 2012. Carman, W. Y. (September 1977). A Dictionary of Military Uniform. New York: Scribner. ISBN 978-0-684-15130-4. http://books.google.com/books?id=0ooUAQAAIAAJ. Retrieved 26 May 2012. Barthorp, Michael (1984). British Cavalry Uniforms Since 1660. Poole, Dorset: Blandford Press. ISBN 978-0-7137-1043-4. http://books.google.com/books?id=zGDjAAAACAAJ. Retrieved 26 May 2012. Newark, Timothy (1 January 1998). Brassey's Book of Uniforms. London: Brassey's. ISBN 978-1-85753-243-2. http://books.google.com/books?id=poqTQgAACAAJ. Retrieved 26 May 2012. Barthorp, Michael (1982). British Infantry Uniforms Since 1660. Poole, Dorset: New Orchard Editions. ISBN 978-1-85079-009-9. http://books.google.com/books?id=RRQ9AAAACAAJ. Retrieved 26 May 2012. Great Britain. War Office (1911). Dress Regulations for the Army. H.M. Stationery Office. OCLC 220555667. http://books.google.com/books?id=oqQWugAACAAJ. Retrieved 26 May 2012. "Anzugordnung für die Soldaten der Bundeswehr" (in German). Dress Codes for Soldiers of the Bundeswehr. Bonn, Germany: Bundesministerium der Verteidigung [Federal Ministry of Defense]. 16 06 1996. ZDv 37/10 (Central Service Regulations). http://www.smafio.net/~sevtrek/FTP/ZDV/37_10/37_10.PDF. "UniR FM 2003 (Uniformsreglemente för Försvarsmakten)" (in Swedish) (PDF). Uniform Regulations for the Armed Forces. Stockholm: Försvarsmakten. 10 September 2002. M7756-770002. http://www.tjelvar.se/pdf/unir_2003.pdf. Norton, William. "Yeomen of the Queen's Body Guard". http://yeomenoftheguard.com/#uniform0. Retrieved 24 March 2012. Norton, William. "Gentlemen at Arms". http://yeomenoftheguard.com/gentlemen_at_arms.htm. Retrieved 25 March 2012.